iPad 2 With NFC-Equipped Accessories, Carbon Fiber Body? 7-Inch iPad Still Alive? 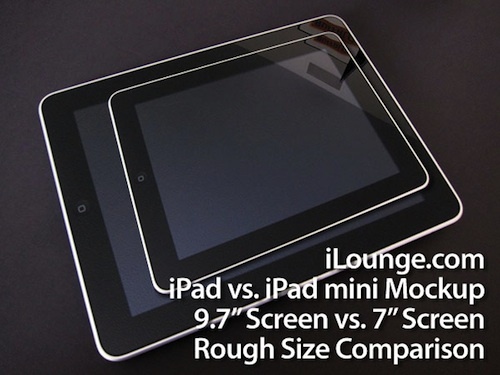 iLounge reports that it has received a handful of details about what may be in store for the second-generation iPad. According to the report, the information comes from a source that has proven reliable in the past but that has cautioned that this information is preliminary and thus some caution should be exercised. First, the source indicates that Apple is indeed building near field communications (NFC) capabilities into the next-generation iPad and that the company is working to develop accessories that can interface with the NFC/RFID chips included in the device. In the most basic implementation, an accessory could announce its presence and potential functions to an iPad or iPhone without the need for a Bluetooth or similar connection; our source suggests that an otherwise simple case could include a radio chip so that an inserted iPhone or iPad could go into power-saving hibernation mode automatically. More complex accessories will go far beyond that. Second, Apple may be shifting from the current aluminum shell for the iPad to one made of carbon fiber in order to reduce the weight of the device. While carbon fiber iPad shells have reportedly been spotted, it is unclear whether they will make their way into final production models. Finally, iLounge's source indicates that Apple has not yet abandoned the idea of a smaller iPad carrying a 7-inch display, despite Steve Jobs having criticized similar tablets as "dead on arrival" due to what Apple feels is an inability to offer a satisfactory tablet experience with the smaller screen real estate. According to the source, one of Apple's suppliers has been asked to manufacture a component that would be used in a 7-inch iPad, but it is unknown whether Apple plans to bring the device to market.